UPDATE 31.5.2013 : Waze has Upgraded the App With Integration of Facebook Events. So you can get the reminder of Facebook events with Waze. Interesting note about Waze is, three Giants Google, Apple and Facebook are bidding for this app. However the deal isn’t finished yet. But Apple denied that they are not in the race. When you talk about the navigation, “Google Maps” is the first thing will come in your mind. Even Apple also can’t beat down the Google Maps in their own iOS. You might think that What is Waze? What can do it for me when I have Google Maps? Google Play store has plenty of GPS Navigation apps, If Google Maps is the Number one Navigation app, then Waze Could be in Number two Position. 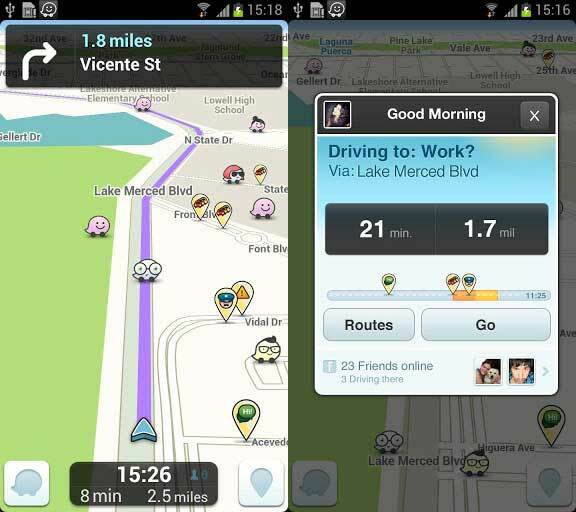 Waze is a fun, community-based mapping, Best free traffic & navigation app for both Android and iOS users. The mapping systems are generated based on the user’s input, and Real-time traffic alerts are also updated by the users of Waze. This service has 40 million mega user base and counting. This community base is the real difference between this app and others in this mapping service. Use this Waze GPS service and join with other drivers nearby to outsmart traffic, save time & gas money, and improve your everyday travel experience. You can find the best route to reach your destination when you have a problem with your routine travel route. All these alternative routes are community shared and confirmed by other users. So you can reach the destination place without any trouble. Most interesting thing of this service is, you can get reports of accidents, hazards, police and other events you see on the road, and get road alerts coming up on your route. And also you can share the above all incidents to community members. You can also find the cheapest gas station in the route you are travelling. Waze map is very basic and simple with limited zooming feature. Like Google Maps, this service has no Satellite imagery mode but controls are intuitive for on the go use. You can control the app using the voice commands. The app itself alerts you using voice and onscreen notification which is the added feature. You have to pay for this in other navigation service, but in Waze you can get it for free. Using Waze GPS service is fun to meet up and coordinate with friends on the road. Connect to Facebook to see friends also headed to your destination. Keep anyone updated about your drive! Send a link to a live map showing your real-time drive and ETA. Waze is community based service for Common Good to make your travel safe and fun. You can get reward points for sharing road info of your local route and get the higher rank in your community.